The Game challenges your own Wu Xing (5 elements) of Water Wood Fire Earth Metal against the universal elements and your opponents’ elements. The object is to exhaust your opponents’ elements. The last player remaining with elements in hand or the player with most elements in hand is the winner of the game. 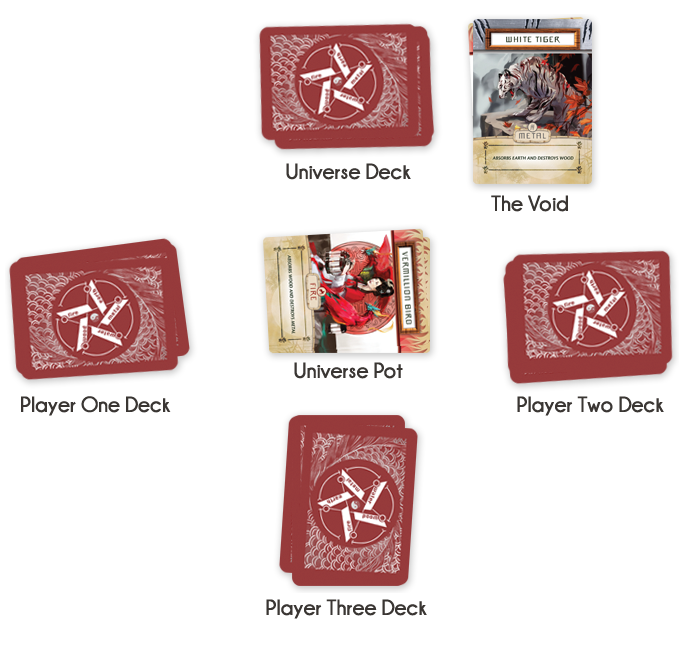 The aim is to increase the size of your own deck by winning the Universe Pot or other players’ cards and avoid your cards being sent to THE VOID or absorbed by the Universe Pot or by other players. 2 – Think WuXing – makes the player’s think about what element to play against who. An online version of the Think version will soon be availiable. Remove the 2 advertising cards. The 52 card deck is shuffled and each player is dealt a “Player Deck” face down. Cards dealt depend on how many players are in the game.